On the fiftieth anniversary of the 1967 Synod of Bishops, Pope Francis outlined his vision for a Church that is “synodal” – where everyone listens to each other, learns from each other and takes responsibility for proclaiming the Gospel. 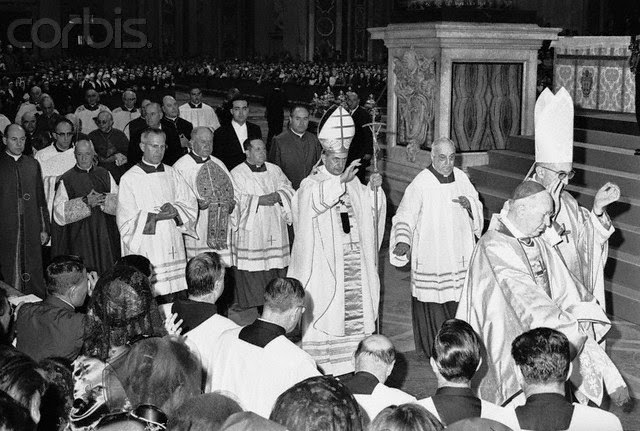 The 1985 Extraordinary General Synod of Bishops that marked the 20thAnniversary of Vatican II’s close, affirmed that communion is the “central and fundamental idea” of Vatican II’s documents. Pope Francis proposes synodality as the People of God’s way to reveal and give substance to communion. It is our model for the AUSCP as we continue our journey, Members and Friends, all of us together. “God has blessed our Association with wonderful growth,” said Father Bernard “Bob” Bonnot, describing the new leadership structure of the Association of U.S. Catholic Priests. Membership of the association includes 1,200 priests and 160 friends. Members of the leadership team approved the new structure January 17, during a planning retreat held in St. Louis. The term, “leadership team,” is used to describe the non-profit organization’s board of directors. Leadership team members meeting in St. Louis: Peter Daly; Greg Barras, newly elected vice-chair; Tulio Ramirez; Sister Jackie Doepker; Lee Bacchi, treasurer; Kevin Clinton, chair; Bill Spilly; Louis Arceneaux, CM; Aiden McAleenan; Bob Bonnot, executive director. Leadership team members not shown: Jim Kiesel; Clarence Williams, CPpS. “As we have grown and times have changed, the range of our efforts and the demands on our Leadership Team members, most of whom still have full time pastoral assignments, have recommended some restructuring,” Bonnot said. The new structure “is natural growth, what our association needs,” said Father Kevin Clinton. • Bonnot is executive director, a new staff position. He is a retired priest of the Diocese of Youngstown who had been serving as chair of the leadership team since 2014. • Clinton, vice-chair since 2014, is now chair of the leadership team. He is a parish pastor in the Archdiocese of St. Paul-Minneapolis. • Father Greg Barras, a parish pastor in the Diocese of Biloxi, was newly elected as vice-chair. • Father Lee Bacchi of the Joliet Diocese, hospital chaplain, continues as treasurer. • Vincentian Father Louis Arceneaux of New Orleans, retreat leader and former seminary faculty member and parish pastor, continues as secretary. • Sister Jacquelyn Doepker continues as executive secretary, a staff position she has held since 2014. She is a Franciscan Sister from Tiffin, Ohio, where she maintains the AUSCP national office. The new structure, along with a three-year strategic plan, was approved by the leadership team members who met in St. Louis, where they finalized plans for the 2019 AUSCP Assembly. It will be held at the Airport Marriott in St. Louis, June 24-27, on the theme, God’s Priestly People: The Baptized and the Ordained.Speakers scheduled include Cardinal Blase Cupich of Chicago, Dr. Richard Gaillardetz of Boston College, and Sister Norma Pimentel of Catholic Charities in the Rio Grande Valley. Father Thomas Rosica, founder of the Salt and Light Network, will lead a day of retreat. AUSCP members are also encouraged to stand for nomination and election to the leadership team at the assembly. Visit www.uscatholicpriests.org. Contact Rev. Bernard “Bob” Bonnot, auscpbonnot@gmail.com, (330) 397-1257; Rev. Kevin Clinton, Kevin.Clinton@npcatholic.org, or Sr. Jacquelyn Doepker, OSF,office@uscatholicpriests.org, (872) 205-5862.